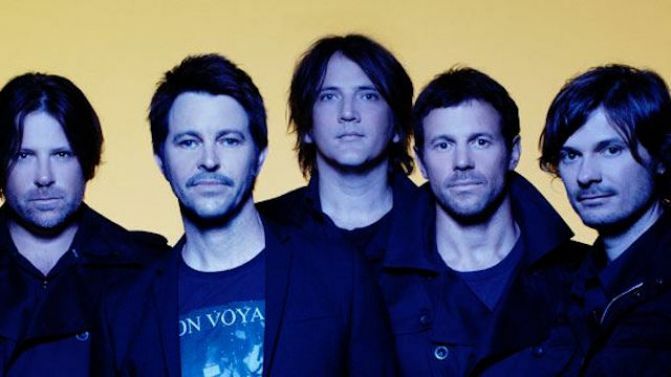 UPDATE 08/11/15: Four fifths of Powderfinger have reunited to perform together for the first time since 2010. Catch video and photos from the show, right here. It looks like Powderfinger fans who are about to mourn the fifth anniversary of the band’s final show could have the chance to see the group (well, four fifths of it) reunite for a show in Brisbane this weekend. A Facebook post by Brissie venue The Triffid, which is set to host an album launch show from Powderfinger’s Darren Middleton on Saturday, suggests the guitarist won’t ~just~ be joined by his previously announced former bandmates Ian Haug and John Collins, but also his former frontman, Bernard Fanning. The Triffid’s Facebook post (below) says Middleton will be joined on stage by his old mates Haug and Collins — “That’s 3 out of 5 members of Powderfinger, and word on the street is Bernard is back in town,” the post reads, announcing that more surprise announcements are in store. If Fanning really is back in town and set to perform with his old bandmates, we’ve got a potential four-fifths Powderfinger reunion on the cards people, with drummer Jon Coghill MIA, for now. Musos who have been confirmed for Middleton’s Splinters album launch show include Jet’s Mark Wilson, Sahara Beck, Karl S. Williams, Mia Wray, Annie Peterson and Marty Brown. Earlier this year, Powderfinger were rumoured to be reuniting to tour in support of AC/DC, but Collins later said the rumours were just “a big fat lie”. Powderfinger split up after completing their Sunsets Farewell Tour in September and October 2010, with Fanning attributing the split to musical compromises.